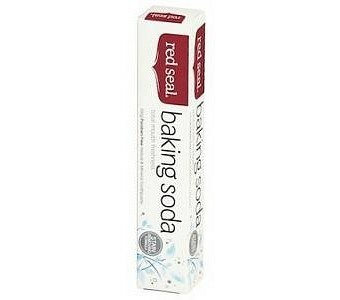 Baking Soda has long been used as a stain remover, and has made an incredible comeback as an ingredient within Red Seal Baking Soda Toothpaste. Red Seal Baking Soda Toothpaste helps support good oral health by offering improved anti-cavity protection. Baking soda breaks down into tiny particles that manage to penetrate enamel crevices, and remove food particles and deeply embedded stains. It also helps to neutralize plaque acids. Note: Non-fluoride. Natural colours. Contains natural herb extracts and oils. Anti-bacterial. Fights plaque and decay. Stain removing qualities. Mild minty taste. Must be used in conjunction with regular and proper brushing. Ingredients: Calcium carbonate; Water (deionised); Baking soda; Glycerol; Sorbitol; Sodium lauryl sulphate; Sodium carboxymethyl cellulose; Silicon dioxide; Sodium saccharin; Essential oils (including Menthol crystals, Peppermint, Aniseed, and Eucalyptus).